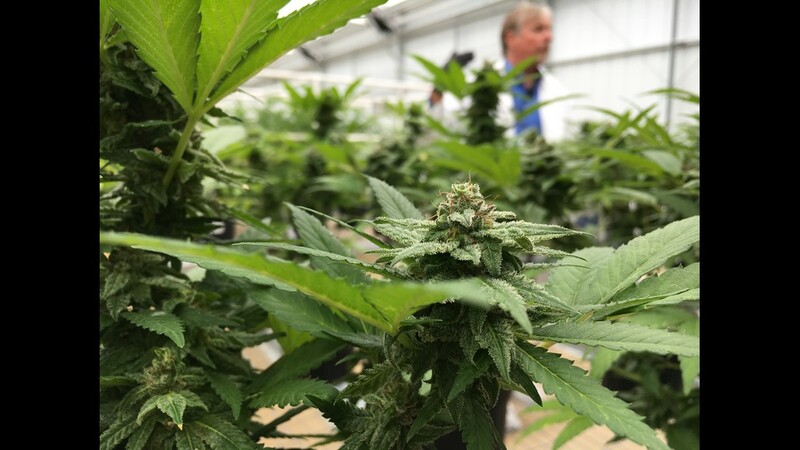 ALACHUA, Fla. – Through a series of business combinations and strategic investments in shell corporations, one of seven licensed medical cannabis businesses in the State of Florida is now in the hands of Canadian marijuana conglomerate. 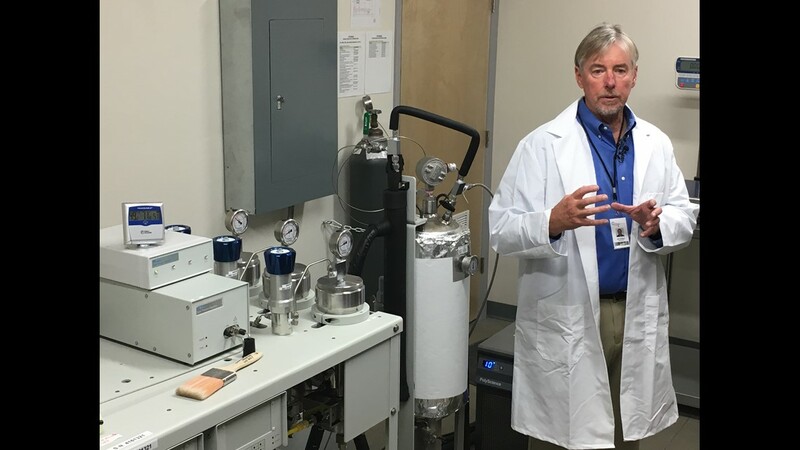 The $40 million acquisition is the first of its kind in the state and it could potentially set the stage for a new wave of private investors looking to get involved in a federally unregulated industry. 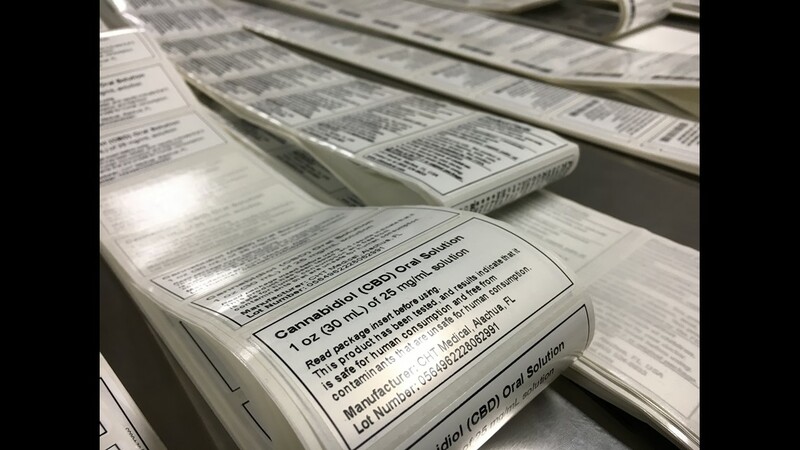 Under Senate Bill 8A, which was signed into law by Governor Rick Scott on June 23, the Florida Department of Health, Office of Medical Marijuana Use – formerly known as the Office of Compassionate Use – will issue 10 new medical marijuana dispensing licenses to applicants by Oct. 3, 2017. Included in the legislation are provisions allowing for the change in ownership of medical marijuana treatment centers, as well as variances on company representation outlined in original applications. As of July 27, Florida has around 26,000 registered patients. With the inclusion of language that leaves some wiggle room for doctors to expand what a qualifying medical condition is, it’s expected that the number of patients will exponentially increase in the months ahead. It was first announced through an international press release in April that Alachua-based Chestnut Hill Tree Farm LLC and its investors were entering into a purchase agreement to sell all of its assets, including the marijuana dispensing license, to a private equity firm for $40 million. Chestnut Hill Tree Farm, which first started producing and distributing medical cannabis under the name CHT Medical at the beginning of this year, is one of only seven licensed companies in the state that can legally grow, harvest, transport, produce and sell cannabis under the vertically integrated system implemented after the passage of Amendment 2. Within a few months of becoming operational, the future of the Northeast Florida marijuana business was suddenly called into question when infighting broke out amongst the original owners and directors over the pending deal. The Miami Herald published an article in May regarding the dispute between Chestnut Hill’s initial directors Jay Odom, Robert Wallace, Deborah Gaw and Robert Beasley. According to reporter David Smiley, the conflict resulted in a lawsuit brought against an interested party who was attempting to derail the pending agreement with a Canadian company that had ties to a Fort Lauderdale private equity firm, the Delavaco Group. The civil case was voluntarily dismissed with prejudice on July 27, according to Okaloosa County records. While unwilling to discuss specific details leading up to the decision, Richard said in an e-mail that Chestnut Hill’s license or ownership had been transferred, thus resulting in a dismissal of the case. On May 22, shortly after HB 1397 died in the Florida House of Representatives, the Office of Compassionate Use, under the direction of Christian Bax, approved the request for a two-stage purchase asset agreement between Chestnut Hill Tree Farm LLC and DFMMJ Investments LLC. The first stage of the acquisition involved a comprehensive management agreement that authorized DFMMJ, a Florida limited liability company and wholly-owned subsidiary of Toronto-based DFMMJ Investments Ltd., to exclusively manage and operate Chestnut Hill’s day-to-day operations under the direction of South Florida lobbyist and attorney Brady Cobb. 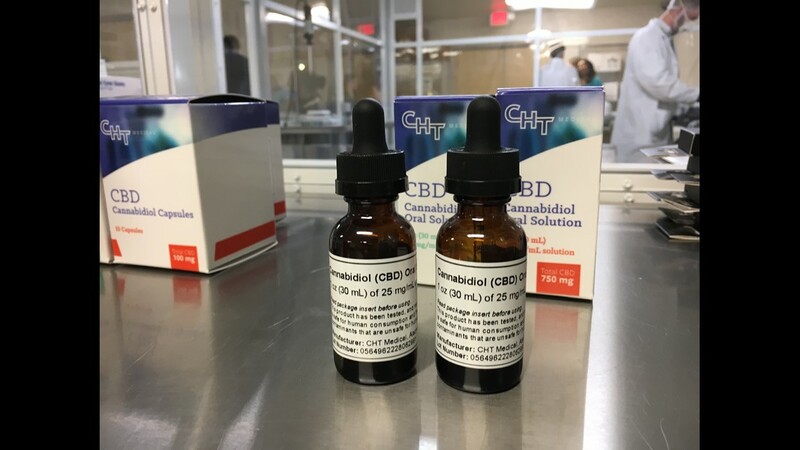 Those operations, as outlined in a press release from May, would include the cultivation, processing and dispensing of marijuana to patients registered in the state, as well as rights to control all financial aspects of Chestnut Hill’s business operations. The latter, of which was not defined in the administrative code Bax referenced, gave a foreign entity indirect control over banking, billing procedures, collection matters and pricing as it pertained to the selling of a federally classified Schedule I substance. 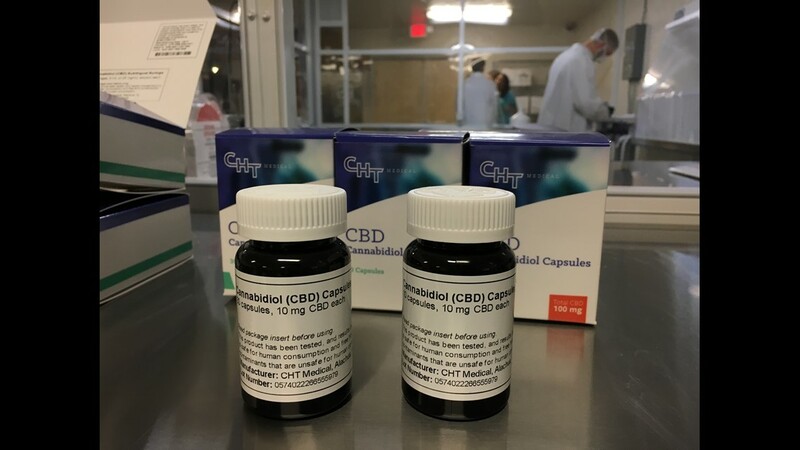 The second stage of the deal would be the official transference of the dispensing license from Chestnut Hill to Liberty Health Sciences USA by way of a business combination involving two shell corporations, DFMMJ Investments Ltd. and a wholly-owned subsidiary of Liberty Health Sciences, Inc., a publicly traded Canadian tech communications business formerly known as SecureCom Mobile. First Coast News reached out to the DOH on June 29 to request further information and clarification regarding the approved change in management at Chestnut Hill. Communications Director Mara Gambineri responded to requests, initially denying any changes at the facility. After providing Gambineri with press releases advising of the managerial shift currently taking place at the Alachua MMTC, she acknowledged the proceedings in a subsequent e-mail. The legislative text in the newly fashioned marijuana bill specifically states that variances in original applications may not be granted for certain requirements that are stipulated under subparagraphs (b) 1 & 2 of paragraph (8). 1. That, for the 5 consecutive years before submitting the application, the applicant has been registered to do business in the state. 2. Possession of a valid certificate of registration issued by the Department of Agriculture and Consumer Services pursuant to s. 581. 131. State Representative Carlos Guillermo Smith, D-Winter Park, said the change in ownership at Chestnut Hill appears to be skirting what the intent of the law is. Rep. Smith has been a long-standing advocate for the passage of marijuana legislation that would have allowed the smoking of the substance. Citing it as unconstitutional, Smith was one of nine members of the Florida House who voted against the passage of SB 8A. He even applauded John Morgan for filing suit against the State of Florida. Florida for Care’s Ben Pollara, said he doesn’t necessarily agree with applying the updated legislative provisions to companies seeking variances, or changes in ownership, because those requirements weren’t part of initial applications. Applicants were originally required to have at least 30 years of experiencing operating a nursery in Florida. However, the state-run system “wasn’t really teed up for Florida businesses,” Pollara said. A lot of states that have implemented medical marijuana have residency requirements written into the legislation, according to Pollara. Florida is not one of those states. Pollara said all of this should raise some concern for the validity of the original application process and what exactly was used to determine whether applicants were suited to run a marijuana business. “It calls into question other parts of the process in that, how does CHT end up with its license in the first place if they are giving a justification for the sale as the fact that they don’t know what they are doing in the marijuana business,” said Pollara, referring to the quotes made by Richard. DFMMJ Investments Ltd. was officially incorporated under the laws of British Columbia on March 20, 2017 with Cobb acting as Director and CEO of the private firm. The company would establish its headquarters in Toronto, Ontario. The company was created “to complete the Business Combination and Acquisition…,” of Chestnut Hill’s assets, as it reads in a letter sent to shareholders of SecureCom Mobile Inc.
First Coast News reached out to Cobb for further information regarding operational changes at Chestnut Hill. Cobb referred the station to comments made by Tallahassee-based public relations firm Bascom Communications. “Chestnut Hill has an approved management agreement and the new entity will be submitting a transfer of ownership pursuant to the new legislation,” said Sarah Bascom. In April, prior to the approval of the management agreement by the state, DFMMJ Investments Ltd. signed a “know-how” license agreement with a Canadian marijuana conglomerate, Aphria Inc. Included in the agreement were the rights to use Aphria’s medical brand in exchange for a perpetual 3 percent royalty on all sales of products. The license agreement gave DFMMJ the right to use Aphria’s greenhouse growing intellectual property at Chestnut Hill in Alachua. Eventually that license would be transferred to Liberty Health Sciences following the closure of the business combination. Valued at C$5 million (US$4,004,500), the license agreement would inevitably secure Aphria’s foothold in Florida’s marijuana market by way of 192,400,000 common shares in DFMMJ given to Aphria as payment for the IP. On April 27, DFMMJ Investments Ltd. completed a private placement offering in Canada thru Clarus Securities Inc. totaling 164,182,679 in subscription receipts, each valued at C$0.208. The offering resulted in over C$34.2 million in gross proceeds held in escrow until the completion of the business combination, at which point receipts would translate to common shares in Liberty Health Sciences Inc.
Financial statements showed that on May 19 Aphria waived escrow release conditions on approximately C$25 million worth of subscription receipts from DFMMJ’s private offering, in part, funding the $40 million acquisition of Chestnut Hill Tree Farm’s assets. Aphria received an additional 120,192,308 common shares of DFMMJ in exchange for the cash, bringing the total to 312,592,308 and giving them a 46.1 percent controlling interest in the company prior to the business combination and consequential conversion of shares. Aphria not only supplied a substantial amount of funds for the acquisition of Chestnut Hill, the Canadian marijuana conglomerate invested C$463,916 in DFMMJ Investments Ltd., fully funding the initial start-up costs and operations. “For the period from the date of incorporation of March 20, 2017 until April 30, 2017, Holdco (DFMMJ) did not have any operations and therefore did not have any revenue,” a letter sent to SecureCom shareholders reads. Prior to shareholder approval of the business combination, SecureCom safeguarded future endeavors by loaning DFMMJ C$4.45 million, which was used as a non-refundable deposit on the agreed $40 million purchase price for Chestnut Hill’s assets. Despite the lack of revenue and business track record, the Office of Compassionate Use approved the terms put forward by Chestnut Hill in the agreement to have DFMMJ exclusively manage the company and all its assets. “Holdco (DFMMJ) currently has no source of operating cash flows, but expects to generate revenue from operations upon completion of the Acquisition and expects to have sufficient cash flow to meet its objectives,” the SecureCom shareholder letter reads. Those objectives, as outlined in the letter, includes an expansion in Florida within the next 12 months through a “network of dispensaries.” A necessary expansion for Chestnut Hill, as they have yet to open a dispensary and have been forced to deliver all product to its patients. “It is only the beginning for our plans to be a dominant player in the medical cannabis industry internationally,” Neufeld said in a May press release following approval of the management agreement. It was also stated in that press release that both Aphria and Liberty received “transactional advisory services” from the Fort Lauderdale private equity firm, the Delavaco Group. The Delavaco Group founded DFMMJ, arranged the acquisition of Chestnut Hill and is a “significant shareholder of Liberty,” per the release. Representing both Aphria and Liberty Health Sciences in all transactions and related governmental affairs leading up to the acquisition of Chestnut Hill’s assets was none other than Cobb. Following the closing of the SecureCom shareholder-approved business combination on July 21, Aphria’s C$65 million stake in DFMMJ translated to 106,864,103 common shares in Liberty Health Sciences Inc., a 37.6 percent controlling interest in ownership. Aphria and Liberty entered into an investor rights agreement as a result of the business combination. The agreement gave Aphria the unique privilege to designate two nominees to the board of directors of Liberty for as long as Aphria maintained at least a 10 percent interest in ownership. Nominees included Aphria co-founder John Cervini and Neufeld, who was elected to serve as chairman of the board. Additionally, former SecureCom CEO Michael Galloro was chosen to stay on as a director. Incidentally, Galloro is also currently serving as COO of the Delavaco Group. Originally presented to and approved by shareholders that Cobb would remain involved in the corporate structure at Liberty Health Sciences, he was suddenly removed and replaced by incoming CEO and Director George Scorsis in the days leading up to the Canadian Securities Exchange’s approval. 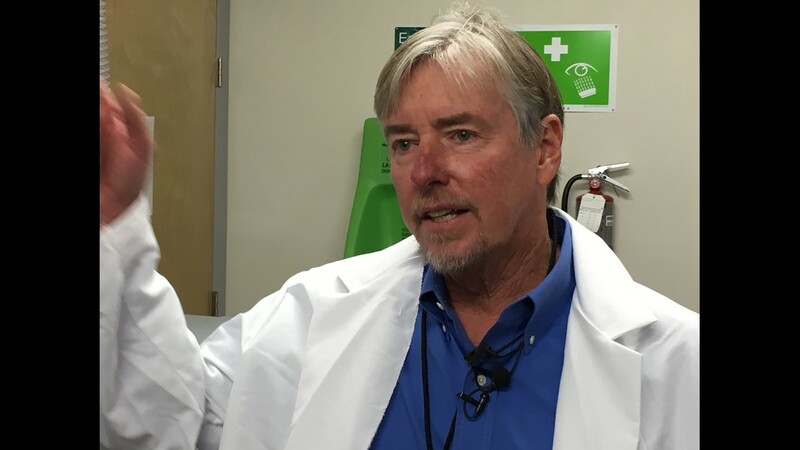 Liberty Health Sciences has refused to comment on the matter and denied First Coast News’ multiple requests to interview Scorsis. While not much is known of Scorsis’ experience in the medical marijuana field, his name was included in the management agreement between Chestnut Hill and DFMMJ. Both Scorsis and newly appointed Liberty CFO Rene Gulliver were tapped to be managers of the day-to-day operations at Chestnut Hill when DFMMJ took over. Brady has handled several notable cases including: severing as general counsel for an industry leading medical cannabis cultivator and its US Expansion entity in the successful acquisition of one of the seven medical cannabis cultivation and dispensing licenses in Florida, which required extensive legislative and executive branch lobbying to facilitate the closing of the transaction, intensive contract negotiation amongst a myriad of parties and their counsel, state and federal compliance as it pertains to the controlled substances act, banking and transactional concerns, and obtaining groundbreaking regulatory approvals for a foreign entity to acquire and operate a licensed medical cannabis cultivator and dispenser in Florida. All roads lead to somewhere and the roads for DFMMJ, SecureCom Mobile, Liberty Health Sciences and Aphria lead back to Fort Lauderdale. And the reason why may not be as complicated as all of the corporate dealings. While the U.S. federal government continues its prohibition on marijuana, seemingly in spite of the 29 states that have decriminalized it to some extent, Canada has emerged as a viable option for investors and private firms looking to raise capital thru public offerings and private placements. The U.S. Securities Exchange Commission has remained steadfast in its mission to protect investors from fraudulent or illegal offerings since 1933. In doing so, they have paid special attention to recent marijuana-related companies looking to raise capital through public offerings. Not to say the SEC is denying every listing request, but full disclosure is expected when detailing the risk factors potential shareholders could face by investing in a federally illegal substance. Major U.S. stock exchanges, however, will not accept listings for companies solely related to the production of marijuana. So far, only a handful of pharmaceutical companies and others that provide ancillary products indirectly related to the marijuana industry have had some success in formal exchanges. Even then, returns have been minimal at best. Consequently, this has made it very difficult for new marijuana enterprises to expand operations. Coupled with a complicated and daunting U.S. banking situation that has resulted in a mostly cash-fueled marketplace, many entrepreneurs are forced to rely on private investors or equity firms to raise capital. The Canadian Securities Exchange (CSE) however, has been very liberal with marijuana-related companies looking to go public. There are over 50 companies currently trading on either the Toronto Stock Exchange (TSX) or the CSE. With headquarters in both Fort Lauderdale and Toronto, the Delavaco Group has been actively involved in the structuring of private placements, public offerings and business combinations on the TSX and CSE since its founding in 2007. The Delavaco Group has dealt in everything from major retail and consumer franchises to distressed real estate and oil and gas exploration businesses in South America. One of the company’s more recent additions to its investment portfolio has been Aphria. Delavaco founder and CEO Andrew DeFrancesco is credited on the company’s website as being the founding investor and strategic advisor to Aphria since its inception in 2014. Under DeFrancesco’s advisory, Aphria has climbed the ranks in Canadian markets and even began trading in the U.S. on over-the-counter venture market (OTCQB) in 2016. 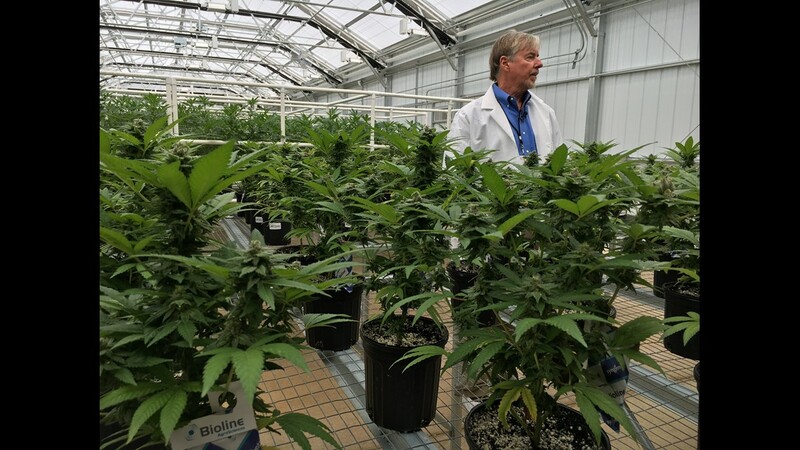 Aphria has managed to raise the capital necessary to increase growing capacity, as well as expand operations into places like Florida, through numerous public offerings and private placements in Canadian markets. Aphria has also invested heavily in at least 10 marijuana-related companies in North America, not including CannWay Pharmaceutical Ltd. which Aphria acquired outright in January 2016. 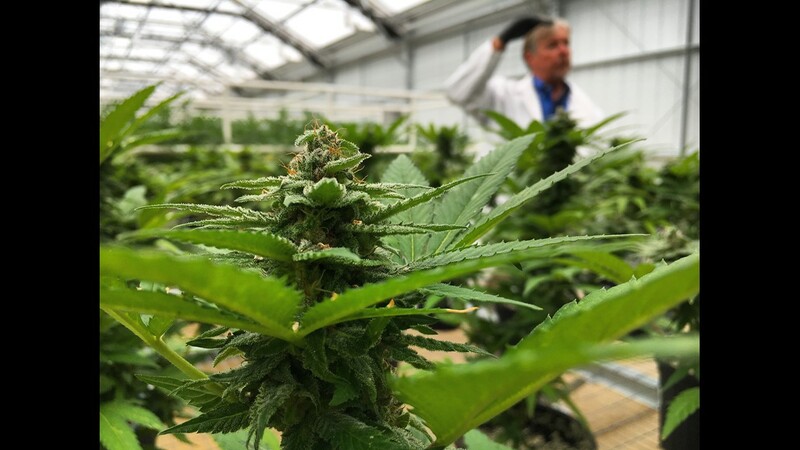 Aphria first cut its teeth in the U.S. cannabis business back in October 2016 when the company entered into a similar intellectual property agreement with Copperstate Farms. Aphria currently owns over 16,000 membership units in the Arizona medical marijuana business, valued at approximately C$9.3 million. As of February 2017, Arizona had over 114,000 patients, the third most in the country behind Michigan and California. Aphria has consistently improved its financial statements every year since the company was formed in 2014. In its most recent income statement, Aphria recorded C$20.4 million in revenue for the year ending May 31, 2017, a substantial increase from the C$551,430 the company recorded in 2015. Meanwhile, the Delavaco Group has simultaneously kept its grip on a burgeoning Aphria through numerous bought deals totaling 56,758,370 common shares of the 138,628,704 issued and outstanding, giving them a near 41 percent interest in ownership. Some may argue that all of this is just capitalism, a shining example of the American Dream repackaged and sold by the gram. Florida Harvest Company CEO Chris Horton, on the other hand, does not subscribe to that notion and sees this as pure favoritism. "The first part sure as hell wasn't capitalism," said Horton regarding the original licensing process. "They [Department of Health] don't care. They follow the money. So if you want to play at that level, that's how you have to do it." Horton's firm provides advisory services to those who are looking to break into the Florida cannabis industry. Most recently, he's been working with sovereign tribes in helping them apply for dispensing licenses. People like Pollara and Horton, who are familiar with the updated legislation and the politics surrounding the new industry, agree that all of this is a direct result of what was agreed upon by state legislators. The $40 million acquisition of Chestnut Hill may have been the first of its kind in the state, but it certainly won’t be the last. Foreign investors and private holding companies with vast amounts of cash and infinite securities are beginning to step into the light with their eyes actively fixated on what is predicted to be the second most profitable medical cannabis market in the country by 2020. The sky is the limit for these companies while the federal government tries to determine if cannabis has any medicinal value. Meanwhile, its monetary value in Florida has just been spoken for. The tiny crystals seen here on this marijuana plant are the key ingredients in the processing of the CBD medicine. Chestnut Hill's strain of high-CBD cannabis is available in a variety of forms ranging from oral capsules to vaporizing cartridges. 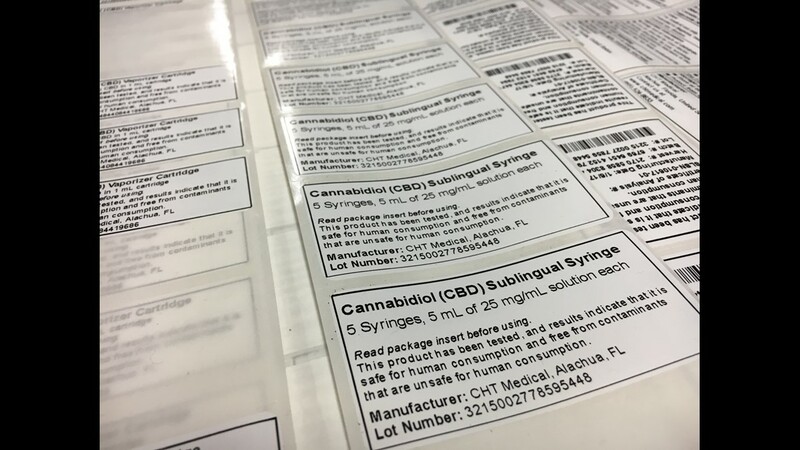 A long strip of packaging labels are waiting to be applied to the sublingual syringes containing the cannabidiol medicine.